We are currently in the Pre-Production phase of a new Fan Series called Quantum Reach. Quantum Reach is a fan-based expansion of the TV show Quantum Leap, picking up 20 years after the end of the original series. The story follows the exploits of Samuel Beckett's son, William, a child born from the butterfly effect of Sam changing his own life while leaping. William "Billy" Beckett spends his childhood obsessed with following in his father's footsteps having spent his life living amongst the project and hearing the stories from Al Calavicci and his mother. He takes it upon himself to re-activate the long abandoned Quantum Leap project to connect with his father the only way he believes possible. Traveling through time and righting what once went wrong. Using what he has learned about the project from his mother and Ziggy's last logged files, the boy genius attempts his quest using a modified quantum accelerator and the new Ziggy 2.0 which manifests as a hologram, aiding William just like Al did Sam. Throughout his journey he discovers that his father is still alive and traveling through time. Knowing this, he expands his mission to retrieving his father by chasing his quantum signature to bring him home. If you have any questions, comments, or general input message me here on the forum or on facebook. We'd like to keep all the die hard fans in the loop and informed as much as possible. Interesting! Keep us all posted! Feel free to use anything you'd like from the site if it helps you get your project off the ground. Is this going to be a video series? If so, I would be honored to provide authentic QL visual effects. I can do the Leap and Imaging Chamber Door effects. Yes, this will be a live action web series. Thank you for the special effects offer, we'll definitely keep that in mind. We will not regularly be needing the "Classic" leap effect as it will be different for William. Much like the evil leapers had their own leap effect William will too. The "Classic" will be seen a couple of times throughout the series to show that he's just missed his father. It will be Sam's "leap style" so that he can be recognized when leaping out of other people's lives, since we can't get Bakula. As for the imaging chamber door; we won't need that until towards the end of season 1. Z2 is already a hologram so she automatically appears in the imaging chamber. But we intend on having a few very special circumstances where some real people will walk through the door. Update 1: To wet your appetite! After much time in our latest QR Think Tank session we have finalized our complete story arch and feel we can successfully pay homage to QL, put our own 21st century flair on it and tell an amazing story in the process. We will be doing 30 episodes over the course of 5 seasons, with each episode ranging from 45-60 mins (A little extra for season finales and the series finale). Right now what we need from Quantum Leap fans is just a little nod. Let us know how interested you are and what you want to see happen. Any and all reasonable suggestions will be carefully considered. 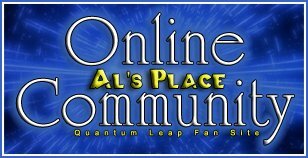 Make sure to like us on facebook.com/QuantumReach. A little like goes a long way. It let's us physically know our potential audience and that's where we update the most. The more likes we see, the more we'll let you in on secrets and things to come for the series. We'll keep you posted on casting, script completions, production dates and more. At this time we'd like to offer the episode 1 & 2 treatment as our first fan reward. 100 likes and you guys will get the first sneak peek into our minds and what we have planned. Get us to 200 and we'll start talking about fan raffles and prizes featuring Quantum Reach and Quantum Leap swag. Just let us know you're listening and we'll keep you all informed and well rewarded. Hope the project goes well for you. I'm also hoping for you that it all goes really well. Sounds excellent. Was Billy conceived during "The Leap Back"? I posted this question on facebook, but I'll do it here too: are you in need of any writers? Some of the concepts I've written about in The Virtual Seasons have delved into alternate realities and timelines, and time paradoxes. There's actually a storyline I still haven't finished, but am hoping to finally complete it this year. When it's done, I will have made it possible for infinite timelines and realities to co-exist peacefully without contradicting each other (so that in effect, EVERY piece of QL fan-fiction ever written or produced is considered "canon" to a certain extent). I could stick a reference to the Quantum Reach reality in there somewhere.